GL_AMD_draw_buffers_blend – not yet documented. I guess this extension concerns the possibility to do blending with FBO. GL_ARB_copy_buffer: This extension provides a mechanism to do an accelerated copy from one buffer object to another. This may be useful to load buffer objects in a loading thread while minimizing cost and synchronization effort in the rendering thread. GL_ARB_copy_buffer introduces a new function called CopyBufferSubData(). This functionality was already exposed via GL_EXT_copy_buffer. This extenion is not (yet) exposed in the latest ForceWare drivers. GL_EXT_draw_instanced: this is the same extension than GL_ARB_draw_instanced already supported in previous drivers. This extension allows Geometry Instancing, (rendering of multiple instances of an object with a single draw call). To see geometry instancing in action, start GPU Caps Viewer, and launch the demo “HW Geometry Instancing”. WGL_AMD_gpu_association: cool this, extension is at last documented. So let’s see what the spec says: There currently is no way for applications to efficiently use GPU resources in systems that contain more than one GPU. Vendors have provided methods that attempt to split the workload for an application among the available GPU resources. This has proven to be very inefficient because most applications were never written with these sorts of optimizations in mind. This extension provides a mechanism for applications to explicitly use the GPU resources on a given system individually. By providing this functionality, a driver allows applications to make appropriate decisions regarding where and when to distribute rendering tasks. This extension has the same role than NVIDIA’s WGL_NV_gpu_affinity: an application can bind an OpenGL render context to a specific GPU (when several GPUs are present). But AMD extension differs from NVIDIA one by the fact it’s available on gamer video cards while WGL_NV_gpu_affinity is present only on professional cards (Quadro). All GPU Caps Viewer’s tech demos work perfectly on a Radeon HD 4850 + Catalyst 9.6 beta. Seems the FurMark‘s optimization tweak has… disappeared. Or the beta version of the new FurMark I’m working on is not recognized by Cat9.6… More on this later. Interesting… seems AMD is updating seriously the OpenGL part of Catalyst. Catalyst 9.6 starts to support geometry shader by adding 512 geometry uniforms. In previous version, this value was 0. And compared to previous versions, the number of vertex and fragment uniforms has been multiplied by 2: 1024. ATI Catalyst 8.12: Four New OpenGL Extensions! 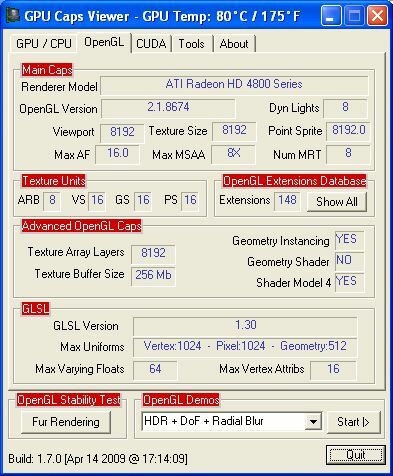 Geometry Shaders with OpenGL on ATI cards ? Fake ! I’m glad they finally heard my prayers, that was a nonsense to only give access to GS with Direct3D. It seems like everytime I’m about to drop my ATI card to an NVidia one, they make just that little step that make me say “hum, ok, one last chance ATI ! I’m watching you now ! Next time…”. So….better openGL support means we will see better Linux Compiz support? Have you tried the x server video decoding in Compiz? More like 5 new extensions and 10 new lines in extension list. They’re making GS in GL for the third (fourth?) month now. In Catalyst 9.5 you can already successfully compile GS, and bind it. Too bad it’s skipped when rendering. Maybe a few months more and it’ll be ready. Okej, for me it just lacks GL_ARB_uniform_buffer_object and after that, it’ll be perfect ^^. So what are the chances of these drivers fixing the CrossFire issue in Fallout 3? 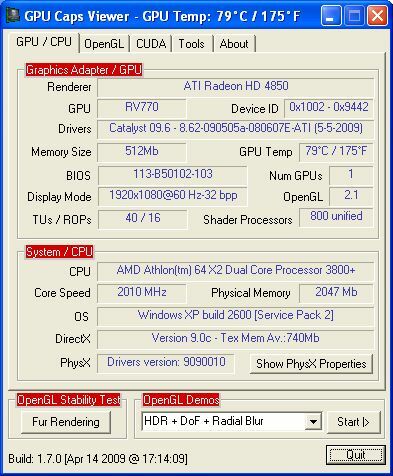 Also would like to know if there are any updates after catalyst 9.3 for the Radeon X1950 Pro cards on WinXP x64? – Seems that AMD isn’t producing updated drivers for them anymore, but what about 3rd party ones?